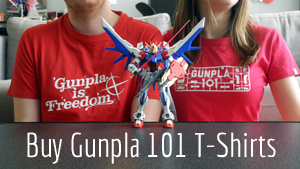 Now You Can Buy Gunpla 101 T-Shirts! Readers, I am so happy to announce that Gunpla 101 now has its own T-shirt line! Working with our logo designer, Ben Huber, we’ve come up with shirts for every shape and size that will show off your Gunpla spirit to anyone who sees them. In the top photo, John is wearing his Gunpla is Freedom shirt in Char’s Custom Red Men’s Medium, and I am wearing my Gunpla 101 shirt in Trans Am Pink Women’s Small. In the bottom photo, John is wearing his Gunpla 101 shirt in Iori Blue Men’s Medium, and I am wearing my Gunpla is Freedom in Zeta Blue Women’s Small. We ordered our shirts early to check for issues. Our shirts are prototypes with slight printing errors, and look slightly different from the improved quality designs you can now buy in the shop. Q. How much do the shirts cost? A. After crowdsourcing our Facebook community about what they think would be a fair price to pay, we have priced every shirt at $19.99. Q. What sizes do the shirts come in? A. Men’s shirts range from S to 5X and women’s shirts go from S to 3X. We chose Spreadshirt’s Premium shirt offering, which was a little more expensive, but they’re very comfortable and soft. Q. I’m outside the U.S. Can I still order a shirt? You bet! Put your country into Spreadshirt’s shipping times chart to see how long it will take. Q. What happens if there’s an issue with shipping? A. All printing and shipping is managed through Spreadshirt, so any issues should be brought to their customer support. So far, we’ve had speedy shipping and no problems with our orders! Q. I want my shirt in a certain color, but I don’t see it in the shop. A. You can get the shirt in any color that Spreadshirt Premium is available in. When you click on any shirt in the shop, it will let you choose any size and color there is, from black to green to purple. If you have any other questions, let me know in the comments! We hope you like our shirt designs as much as we do. I can’t wait to see photos of everyone wearing them.